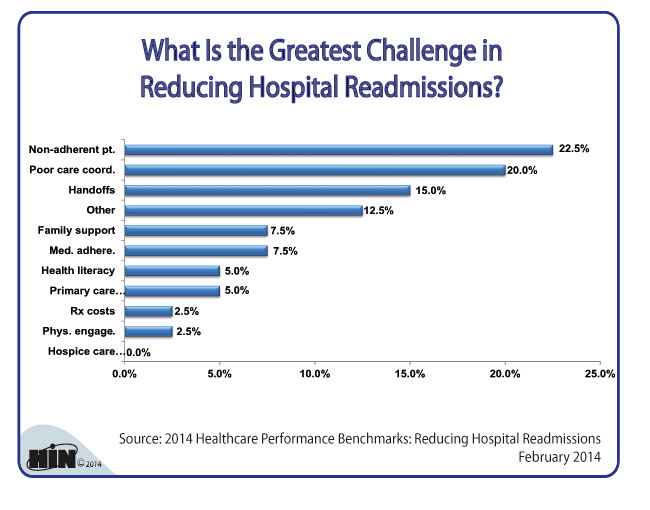 Healthcare Intelligence Network- Chart of the Week: What Are the Top Challenges in Reducing Readmissions? To get instant access to dozens of graphs and tables on reducing readmissions, download a PDF version today for $139. This report documents the latest key initiatives and partnerships to reduce readmissions by more than 100 healthcare organizations. This 60-page report, now in its fourth year, for the first time provides details on partnerships with post-acute care to reduce readmissions from these care sites. You can order your copy of this resource for $139 in our Online Bookstore or by calling toll-free (888) 446-3530. Listen to Melanie Fox, director of the Caldwell Physician Network Embedded Case Management program at Caldwell UNC Health Care, describe how embedded case managers connect with those recently discharged from the hospital, resulting in a reduction in 30-day rehospitalizations from 19.16 percent in 2012 to 9.69 percent in 2013.